Bend, Oregon. If you ask a local, they'll tell you it's a horrible place to live and under no circumstances should you ever consider moving there... all part of their ploy to keep this gem in central Oregon all to themselves! With wilderness just out the back door, adventure is always calling and there are hundreds of miles of trails awaiting in the Deschutes National Forest. 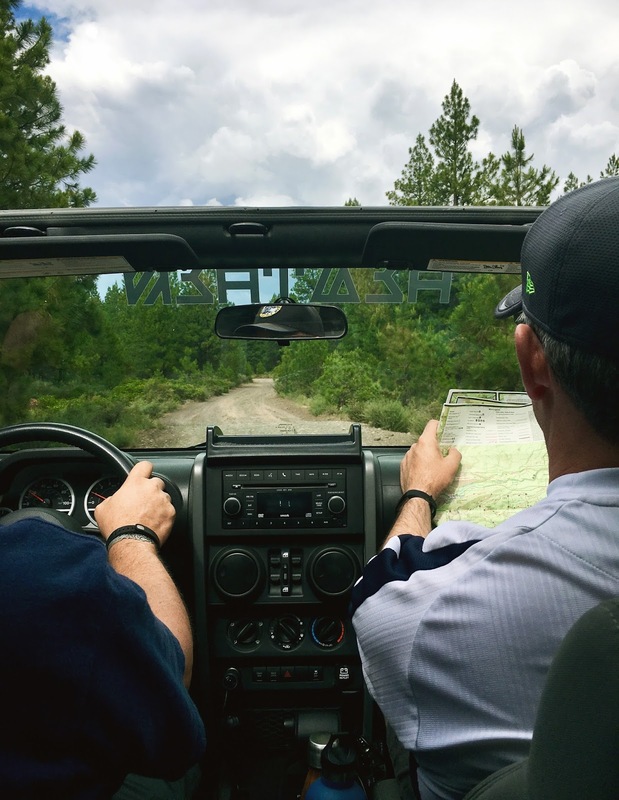 Access to the back country is as easy as turning off the pavement and onto a gravel or cinder road, and within a few miles, you're surrounded by towering pines. It's incredibly beautiful and an easy trailing adventure for anyone with a four wheel drive vehicle and a little clearance. Mrs. Awesome, her awesome mom and I recently spent 5 days during the last week of June visiting family who are fortunate enough to call Bend home. The Bend family was eager to see us, only this time they had a single request- bring Heathen. If you haven't met Heathen, he's our 2010 Jeep Wrangler Rubicon. 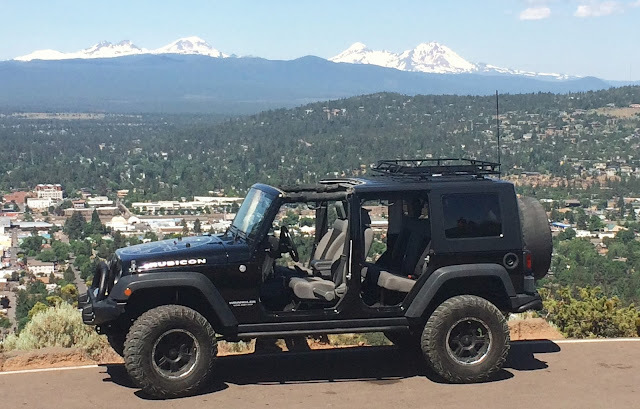 Sitting on 35" Tires a 3" Teraflex lift and Ace Engineering Rock Sliders, he was more than up for the adventure we sought. I'd done a mountain of research prior to the trip, and the National Forest Service offers a plethora of free downloadable maps. Motor Vehicle Use Maps (MVUM) are also available and what's truly incredible about these, is that there is an app which links with the GPS in your phone or tablet which gives you real time mapping even without phone signal. The app is called Avenza and you can download it free here as well! A couple of means of navigation are important and the Bend family had a hard copy map as well which was quite handy. Was it a left or a right after the 532nd tree? For our run we planned on taking forest roads from the west side of Bend to Three Creek Lake. We headed out of Bend on Skyliner's road, on the west side of town. After a couple miles we turned right on Forest Road 4606 and then a quick left. My awesome brother-in law had navigation duty and before long we were climbing upwards into the foothills and above Bend. Mt. Bachelor, a lot closer up! The streams were flowing pretty fast! As we climbed the air got cooler and before long we turned along the road which led us the final nine miles to the lake. However a couple miles in, we started to see snow and before long, the trail became nearly impassable. Discretion being the better part of valor, and knowing we had to get back before dinner... we finally reached a point where I decided we'd have to turn around, rather then risk the chance of getting stuck. Heathen's equipped with a winch and I had all of the recovery gear necessary, but I think the best way to keep from getting stuck in the first place is knowing when to change your plans. We had a blast in the snow and mud, and with the doors off, we all got plenty muddy. The laughs and memories were more than enough! And really, that's what A Loved Lived Life is all about. Taking the road less traveled, finding your happiness and joy. 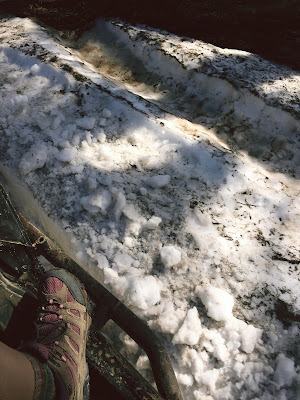 In our case, it wasn't an icy mountain lake, but rather an impassable road, a foot and a half of snow and a muddy trail. Get out there and go have fun!